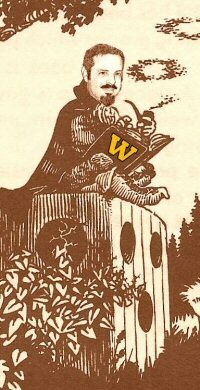 Reputation: Waynes Books has sold thousands of books and games to Amazon.com customers since 2002, scoring an average 100% in customer satisfaction. What does Wayne's Books have currently in stock? How do I buy from Wayne's Books directly? Visit WaynesBooks.net, where you can search my inventory of thousands of new, used, and collectible books, games and maps, all available for immediate shipment worldwide. Secure shopping cart combines purchases for cheaper shipping. Payment by credit card, Paypal, or checks/money orders accepted. I can't speak highly enough about "Heroic Worlds" by Lawrence Schick. If you enjoy a wide variety of classic RPGs, you owe it to yourself to pick up this reference. 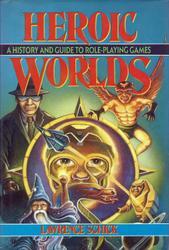 A comprehensive list - with descriptions - of all RPG product lines published up to 1990, this gem also includes essays by a Who's Who of the gaming industry: * David L. Arneson * N. Robin Crossby * Greg Gorden * E. Gary Gygax * Steve Jackson * Paul A. Jaquays * Tom Moldvay * Sandy Petersen * Ken Rolston * Ken St. Andre * Michael A. Stackpole * Greg Stafford * B. Dennis Sustare * Erick Wujcik. This is my ever-expanding Reference of Role Playing Games (RPGs). In earlier days, I called this site Krakow RPGs and Wayne's World of Books, but I have since settled on Wayne's Books. I sell science fiction (sci-fi) & fantasy books, but my passion is the world of games. RPGs are both book and game. This site is where I post documentation of games I've sold, seen, or learned of due to your helpful emails. For many obscure games, this may be their only photo and summary available on the web. I focus on pre-2000, out of print RPGs and board games that can be so hard to find now. Most of the game entries have a link to the item for sale at the Amazon Marketplace. There, you can view new and used games for sale by me -- "waynes books" -- or from any one of thousands of Amazon sellers, knowing that ALL purchases are backed by Amazon's ironclad A-to-Z- Guarantee. Amazon gives me a small percentage for each item - whether from me or another seller - purchased through links from here. There is NO extra cost to you, the customer. Think of it as a website donation, but you don't have to pay for it. It keeps the site free from outside advertising. ...and, no, I don't have every one of these games in stock at the moment. I wish I did! The logo is from Chuck Stover's Thorn D20.